I am over my Pinterest addiction. No intervention was necessary. It was a natural progression. A Pinterest Board about "Trending"
I still like Pinterest. It’s just not as interesting to me as it was a couple of weeks ago. I’m not quitting Pinterest. I am not taking down my boards. It is funny to watch people swear off Pinterest. 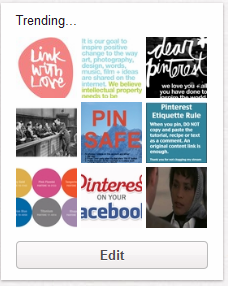 And to try to get others to swear off Pinterest. I am not trying to discourage you from trying Pinterest. Or loving Pinterest. Standing in line at the Lennox Movie Theater recently a 20 something (I am guessing) girl was making fun of a girl she was with having “Pinterest hair.” The hair style was cute. It did reek of Pinterest. Yeah.. I’ve heard so much about Pinterest… I would really be glad to navigate that site. Thanks for sharing! Stephanie I bet you would love Pinterest! That is the fear that spammers will jump on board. Perhaps you are already there. I had to remove the comment love to the post on drug site, sorry. It is just spam. Off to put your email etc. on the blacklist so I don’t have to deal with comment spam from drug websites.